Fall 2004. Summer ended with an antiquing trip to Iowa, where the collectibles seemingly never end. There were auctions, private collections and city-wide garage sales. 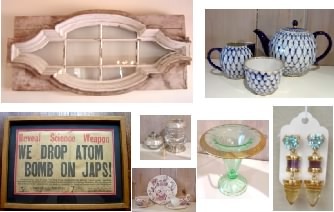 Look for our finds on TheBigFind. Left: The Emporium at Steamboat Rock, Iowa. 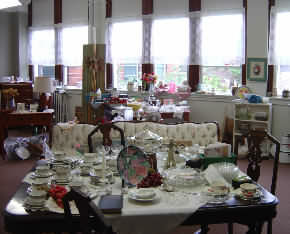 An antique shop inside a former school. Below: A collector's sanctuary in central Iowa. A retired photojournalist made the call to Iowa from Topeka, Kansas. A fully equipped shop houses his passion building model trains. 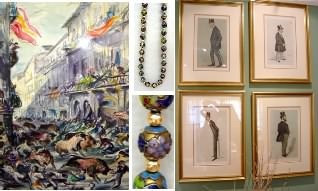 Completed: A wildly wonderful indoor estate sale was held during the early summer in Pinecrest, FL Crowds lined the sidewalk and sales were brisk and fast. 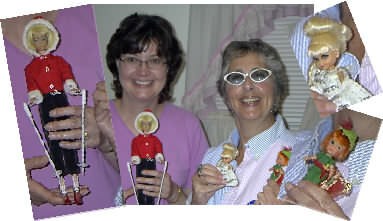 Featured were unique items from around the world including an ebony Baby Grand piano, vintage chairs, an antique hall table, and more. There was china, jewelry, art work, and silver  even garden tools and a patio set. Need help with your Miami area estate sale? Contact Hope. Below: Original art work and jewelry. Details inside.